In early August, a group of 25 from Syndal Combined Probus flew from Melbourne to Brisbane, transferred to the overnight train – ‘Spirit of the Outback’ – and arrived in Longreach 26 hours later. Although sleep was scarce in our 1st Class sleeper cabins, everyone enjoyed the experience. Meals on board were excellent and the staff very friendly and helpful. In Longreach, our hosts for the week, Kinnon and Co, have a great story to tell of their diversification from sheep and cattle farming into tourism. This move was necessary to provide an alternative source of income and combat the ravages of drought in 2006. The current drought conditions commenced seven years ago. The Kinnon’s tourism innovations since 2002 have provided a popular stopover place for campers and other tourists, won many awards, and greatly assisted in keeping the town functioning. Our program, organised by Trade Travel, commenced the evening we arrived, with a country style dinner while watching the Outback Stockman’s show in the grounds adjacent to the Stockman’s Hall of Fame. The following day comprised of a day trip to Winton and included visits to the Australian Age of Dinosaurs Museum, the newly created Dinosaur Canyon and the Collection Room. This was followed by a visit to an Opal retail outlet which included a talk and film on Opal Mining. Lunch was at the historic North Gregory Hotel, where “Waltzing Matilda” was performed for the first time in 1895. Behind the hotel is Arno’s wall – a work of art containing every household item imaginable. A visit to the Waltzing Matilda Centre, recently rebuilt after a fire in 2015, was visited before returning to Longreach, 180 km south of Winton. The next three days included visits to Nogo Station, a working sheep and cattle station owned by the Kinnon family, and hosted by their daughter Abigail, resplendent in period costume. 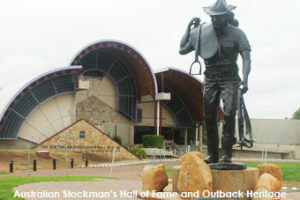 We heard ‘Stories of the Past’ from Scotty, a local identity, visited the Stockman’s Hall of Fame, the Qantas Founders Outback Museum, Camden Park Station with cattle yards, shearing shed and a large solar panel installation in one of their fields. The two Kinnon sons, Jeremy and Lane, entertained with a Cobb and Co Stagecoach Ride, an Old Time Movie, and their own, hilarious, Old Time Tent Show. 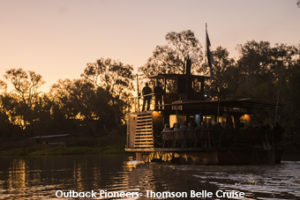 A visit to the Longreach School of Distance Education, Sunset Cruise on the Thomson River, Stockman’s Dinner and a Stockman’s Spectacular Sound and Light Show under the stars concluded the week’s activities. Overall, it was an action-packed, fun-filled and memorable experience that was thoroughly enjoyed by all. Life in Longreach and the Australian Outback is certainly a great contrast to life in the big city!